I love creating lovely gardens and inviting the very best of nature. Woodworking helps me to plan my garden and introduce varieties, bring in nature and make the garden attractive. Here are five of my favorite woodworking projects that I’ve used to transform my garden. You don’t need a lot of expensive woodworking equipment, either. It’d be good if you had access to a table saw to carry these projects out. A good friend of mine recommended that I buy a Ryobi saw last year, and it proved to be very efficient for these projects. Well, let’s get to it then! This was a gift to my father who also loves planting but has back problems and cannot bend. 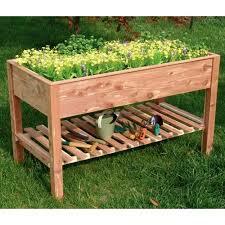 The planter box is a stand where you can plant your herbs, potted plants and vegetables without having to bend. The box is made of wood and stands that reach waist height. You can make it of any length, but the width should be such that you can reach the center from one end. I used cedar decking to create the box and 1×4 cedar planks for the stands. Cedar is bug-resistant and long-lasting. I also ensured that the planks were as close to each other as possible so that the box can hold the heavy weight of the wet soil. You can also buy the standard 8-foot boards to avoid doing a lot of cutting. When building the box, ensure that the stands get through the base of the box for enhanced stability. With a jigsaw, make holes on the part where the stands shall pass, and then glue everything together to make the box even stronger. If you always lose your tools, you can use a potting bench to store your gardening tools and seeds, and pot your plants. I also made a third compartment under the main shelf to store heavier items, like my garden hose and half-full bags of fertilizer and soil. The top bench is built like a hutch for improved storage of tools and seeds. I created a potting bench 51 inches long by 24 inches deep and 65 inches tall. I used wood planks with a width of about two inches. The stands are 3 inches by 2 inches in width. This ensures that they are strong enough to handle the weight. The hutch is made of plywood with a height of half a meter. 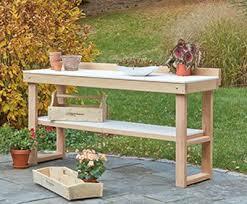 You can create a potting bench within one or two weekends and you do not need to be a professional carpenter. Just ensure that the joints are well fixed and that your planks are glued closely so that they are strong. An old-fashioned wooden wheelbarrow can add a rustic appeal to your yard. I made one a while back to improve the aesthetic look of a shrub, and the results were awesome. 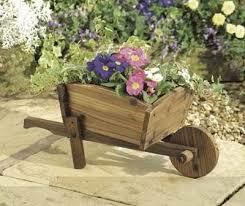 The wheelbarrow planter looks like an ordinary garden wheelbarrow except that it’s made of wood. You can use wood from old furniture or just buy wood for the project. You can complete this project in a single afternoon. Start with constructing the wheelbarrow box. It can be made of about ten pieces of wood depending on the width. In my case, I used 6×1 wood planks. The base of the box was a meter long by a meter wide. As for the sides, I cut the wood in a trapezoidal shape with the shorter length being the length of the box and a longer length of 1.2 meters. This ensures that the box has a wider opening than its base Buy the Ryobi saw to make a circular wheel and to arc the wheelbarrow stand. You can then plant your flowers or vegetables in the wheelbarrow. Just like the three-tier cake, the three-tier planter creates an awesome addition to the yard. It’s a simple woodworking project where planter boxes are arranged in three layers in a stair-like formation. The materials needed for the project include wood planks and nails. I built the stands in a triangular-like formation just like the traditional ladder. The slanting wood plank is about two meters long while the upright plank is about 1.6 meters. The planks join at about 1.2 meters with the upright plank becoming the stand for the uppermost stairs’ where the first box will be placed. The second stair is about 1 ½ feet lower with the supporting plant going all the way to the base. The lowest tier is about a foot from the ground and is held together by a piece of wood that connects the main support beams. I then created conventional boxes out of the old furniture and filled them with soil, placed them on the staircase. The area looks awesome, and I can irrigate the plants with ease with my garden hose. Do you always keep your wine on the ground when you go for a picnic? 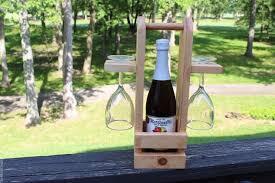 I used to do it and hated it with passion until I came across a wooden wine caddy idea. The wine caddy is made from a single stand with a plank to hold the wine with hollow planks on the top. You can have a two-bottles or a four-bottle wine caddy. The stand should be a plank of wood about a meter and half in height and two inches in width. You may need to create a support base if you would like to be moving around with your wine candy. Then, attach two pieces of wood about a foot in length at about a half a foot from the top. Reinforce the wood by gluing small pieces of wood at the joint. Using a jigsaw, cut holes about four inches in diameter on a block of wood that are of a length similar to the total length of the wood you had attached to the stand. The holes should be about a foot from each other. Glue this piece of wood on top of the stand. You can now slide in your bottles into the holes and have them held at the base so that you enjoy your wine at ease. These are easy crafts that you can handle at home with basic woodwork tools. With these fun projects, you too can improve your yard and make it more charming. If you need to go out and buy a few tools to carry these projects out, be sure to check out a few reviews online before hitting the hardware store! What do you think of this list? 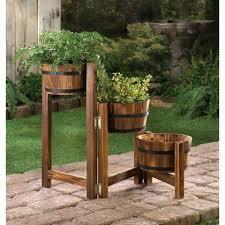 Do you have other exciting woodworking ideas for the garden? Share them in the comments section and spread the knowledge to your friends on social media!